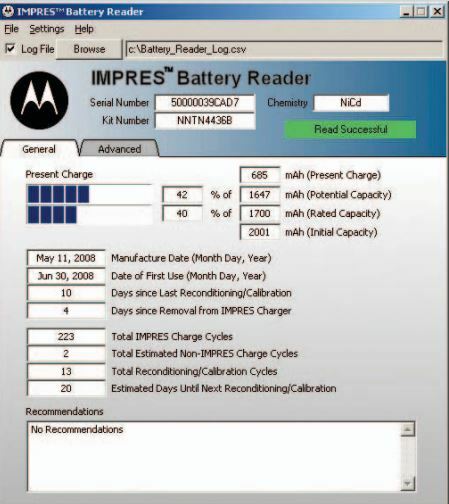 Determine Radio Battery Health Quickly with an IMPRES Reader | Magnum Electronics, Inc.
Motorola IMPRES smart batteries contain valuable historical usage data including date of first use, number of charge cycles, and initial/current/advertised capacity. 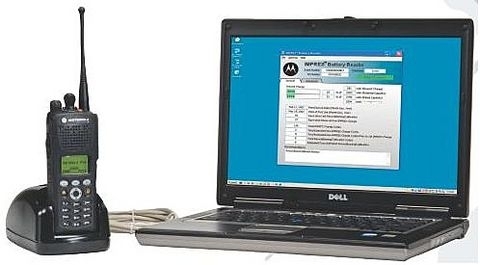 The NNTN7392 IMPRES battery reader will quickly provide the data using a software application that can be installed on a Windows PC with a USB port. The NNTN7392 is not a charger and uses USB power from the PC. All IMPRES batteries are supported with the included adapters. There is no need to charge the battery before connecting it to the reader. In a few seconds the data will populate the IMPRES Reader application. The internal battery serial number, chemistry, and model number are displayed near the top. The General tab displays the vital statistics of the battery. The current mAh capacity is shown along with the potential after charging. You can compare this to the rated and initial capacity when it was new. Bar graphs make it easy to understand. The General tab shows more information to determine the health of a battery. The date of first use, number of charge and conditioning cycles, and estimated days until next conditioning can help determine if a battery should be kept in service. A recommendation window provides additional info if a problem is found. 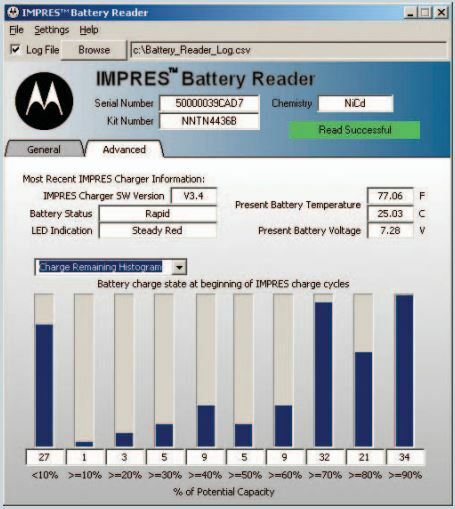 The Advanced tab shows the most recent IMPRES charger information including the firmware version. Older IMPRES chargers with firmware prior to V3.4 should be upgraded to prevent compatibility problems with some newer IMPRES batteries. A firmware upgrade tool and software is required. The Advanced tab also provides past charging information using histograms. For best performance, rechargeable batteries should be placed in the charger when <10% capacity remains. Batteries that are continuously “topped off” do not perform as well and fail prematurely. Download the NNTN7392 IMPRES Reader and the IMPRES Smart Energy Batteries .pdf brochures. This entry was posted in APX Radios, IMPRES, Motorola, MOTOTRBO, Tech Tips and tagged 2-way radio, Batteries, communications, NNTN7392, XPR6550, XTS by magnumelectronics. Bookmark the permalink.